Close friends: word and image! Written words and images are two form of language that prosper in each others company. Our school being situated in the suburb of Skärholmen, we are in the lucky position to have the wonderful paintings of Nationalmuseum very close to us, only half an hour of underground travel away. In Step Into Art we have benefited greatly from this closeness. Our students made 12 paintings from the museum the starting point of their explorations. Our work started with a visit to Nationalmuseum. Art and Swedish language teachers had together with Bongi Jarne McDermott from the museum prepared a selection consisting of 25 paintings. 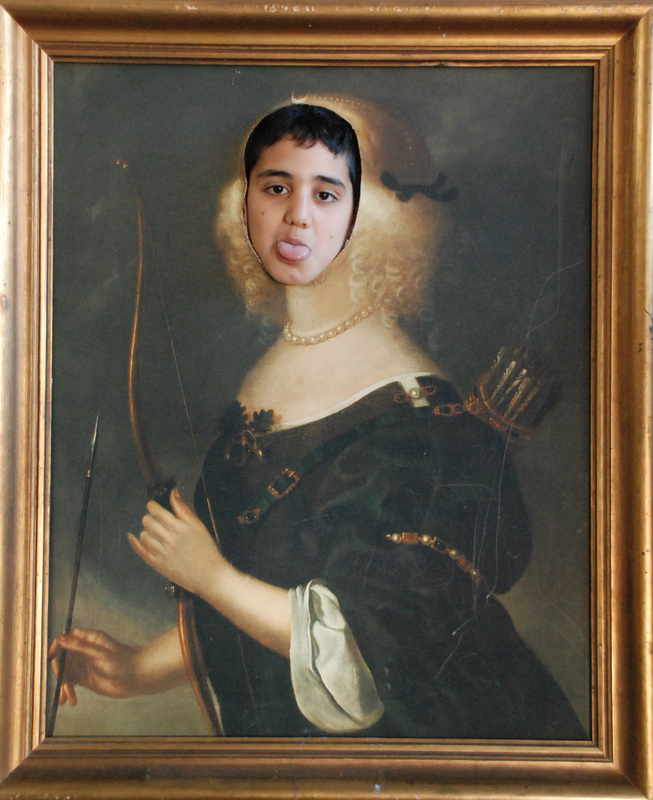 During a tour of the museum the pupils got the opportunity to see all the original paintings. Each of the 62 pupils listed their own special favourites. After the visit 12 paintings remained. You can see them here, as well as what pupils chose which painting. 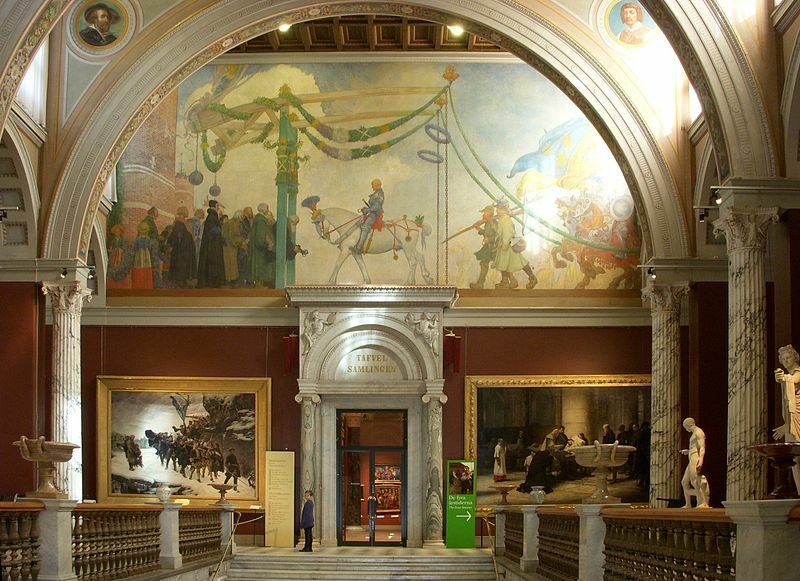 Three of the paintings chosen by the pupils can be seen in the staircase of the museum: Bringing home the body of Charles XII by Gustaf Cederström, Gustav Vasa enters Stockholm in 1523 by Carl Larsson and Death of a hero by Nils Forsberg. Each students were given a colour print of the painting that he or she had choosen, a sheet of paper, a pencil and 30 minutes of silence and concentration. They were allowed to create these text in whatever fashion they wanted. It could be an association, a memory, a poem, a very short story, an internal dialogue or even something as simple as a list of people, animals and objects they could see in the painting. We find this kind of free texts very interesting and rewarding. What thoughts and feeling does the painting arouse directly, before the students have had access to historical and other facts about it? It is also a miracle method for writing. Once the students realize that their freedom during this limited time space is total, that they are allowed to write whatever they want, in whatever way they chose, they often get so engaged that they don´t want to stop writing! Here are these first texts, for the time being only in Swedish! The students first art assignment was this: Imagine that suddenly you experience a dazzling journey through time. All of a sudden you find yourself inside the painting that you have chosen. What do you do in the painting? Do you just gaze around and observe all the strange things and people around? Or do you choose to play an active part in the events that are taking place? The students were first photographed in postures suitable for the stories that they wanted to create. They then extracted their figures using Photoshop and placed themselves in an appropiate place in the painting. A completely new image was created, often several hundred years after that the original artist finished his work. 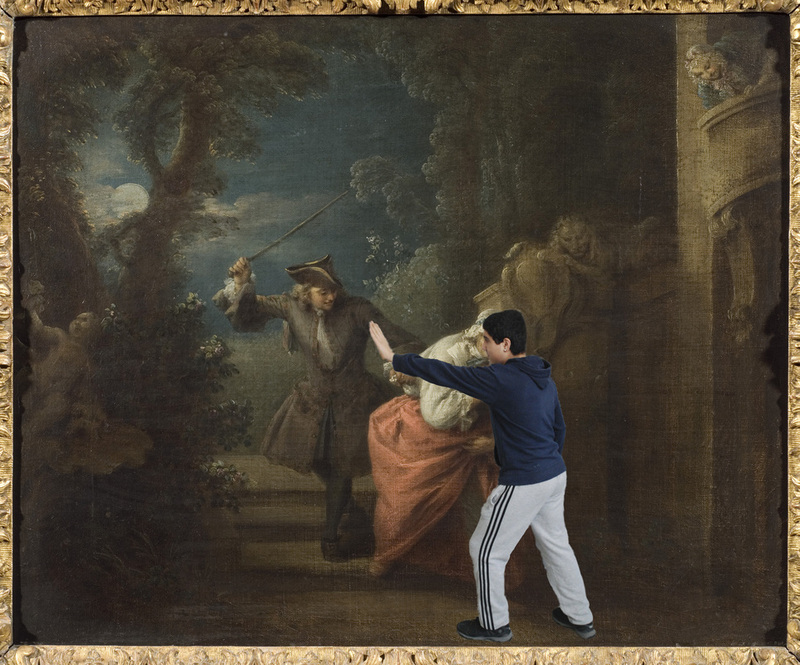 See all the 62 students adaptations of the old masters works here! Marcel Butros takes firm action to stop persecution in Jean-Baptiste Paters painting. See visitors at the Step Into Art mini-exhibition on Skärholmen square being transformed into Diana, the hunting goddess! The students second art assignment was to invite one of the characters from their chosen painting to visit 21th century Stockholm, in a reversed time journey. See all the 62 reversed time travellers here! 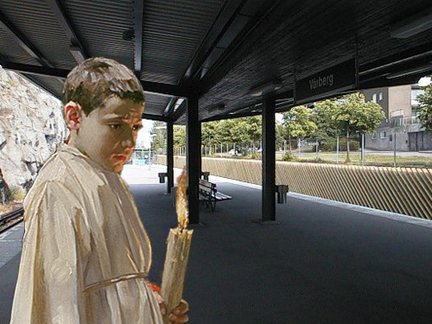 Linda Wong invited the choirboy from Nils Forsbergs painting Death of a Hero to visit the underground platform in Vårberg, close to Lillholmsskolan. Image meets word! Magic occurs! Read accounts from all the time travellers! Browse the magazine, read the students stories and watch the images from their time journeys. Zoom to read the texts and enjoy the images in detail. Back to the point of departure: our students exhibition Step into Art shown at Nationalmuseum from 4th of June 2012 to 3rd of February 2013! Our work started with a visit to Nationalmuseum, and we hade the great honour and joy to be able to finish it at the museum. On the ground floor the students work was exhibited during summer, autumn and winter 2012-2013. 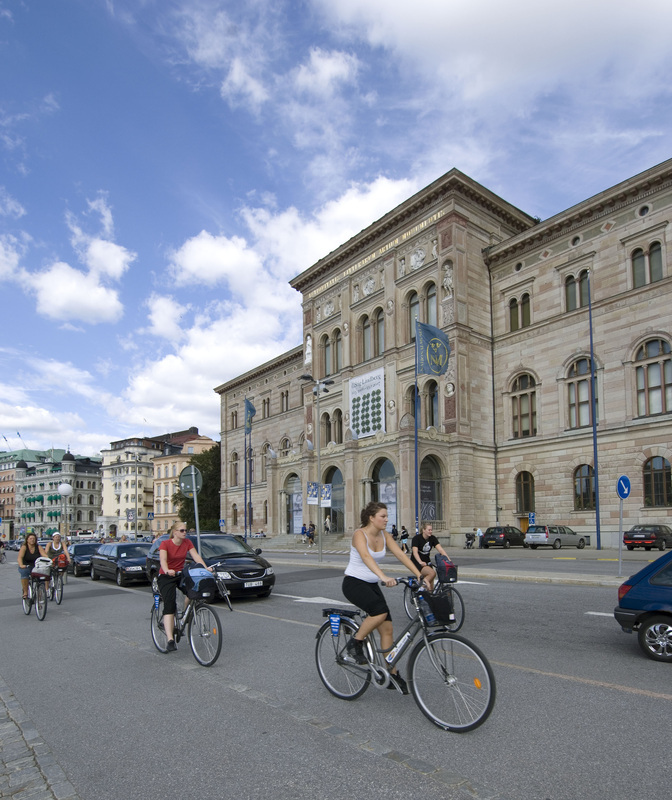 Nationalmuseum is now closed for renovation, but our project is described on the museums webpage. You have come to the web pages of the Art Department of Lillholmsskolan, a local elementary school located i Skärholmen, a suburb some 15 kilometres south of Stockholm, Sweden. 650 children study at our school, in the ages 6 to 16. 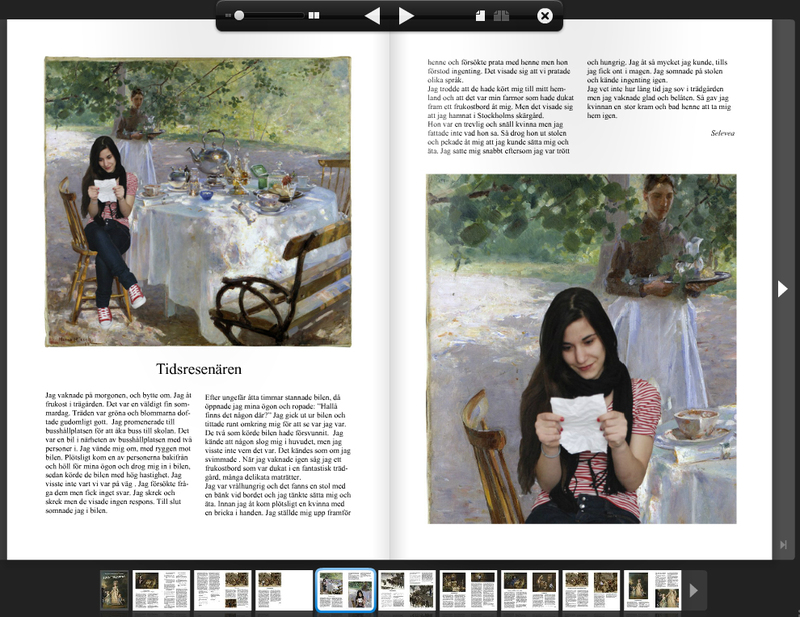 Three other pages are available in English: Educational Art Games, Listen! Now I´m talking! and Free Image Editors.